A Cretaceous arachnid Chimerarachne yingi, found trapped in a 100 million year old amber from Myanmar, appears in a handout illustration provided on Feb. 5, 2018. If you are not a fan of spiders, you may not like the creepy little arachnid scientists found entombed in chunks of amber from northern Myanmar. Unlike its spider cousins alive today, this guy had a tail. Scientists on Monday described four specimens of the arachnid, called Chimerarachne yingi, that inhabited a Cretaceous Period tropical forest about 100 million years ago during the dinosaur age. Alongside modern spider traits such as a silk-producing structure called a spinneret, it possessed a remarkably primitive feature: a whip-like tail covered in short hairs that it may have used for sensing predators and prey. "It is a key fossil for understanding spider origins," said paleontologist Bo Wang of the Chinese Academy of Sciences. "Our new fossil most likely represents the earliest branch of spiders, and implies that there was a lineage of tailed spiders that presumably originated in the Paleozoic (the geological era that ended 251 million years ago) and survived at least into the Cretaceous of Southeast Asia." Despite its fearsome appearance, the fanged Chimerarachne was only about three-tenths of an inch (7.5 mm) long, more than half of which was its tail. University of Kansas paleontologist Paul Selden said Chimerarachne represents "a kind of missing link" between true spiders and earlier spider forerunners that had tails but lacked spinnerets. "Chimerarachne could be considered as a spider. It all depends on where we decide to draw the line," Selden said. "I am sure arachnophobes would not like this animal, except that it is only a few millimeters long, so it would be living almost unseen by them." The earliest arachnids, a group including spiders, scorpions, mites, ticks and others, dates to about 420 million years ago. The oldest-known true spiders lived about 315 millions year ago. 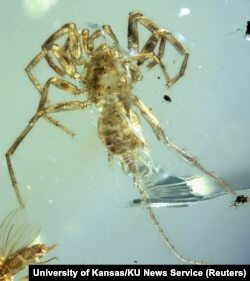 The Cretaceous arachnid Chimerarachne yingi, found trapped in amber after 100 million year appears in a handout illustration provided Feb. 5, 2018. Numerous animals and plants have been found beautifully preserved inside amber, which is fossilized tree resin. Many important amber finds have been made in Myanmar. Chimerarachne may have lived under bark or in the moss at the foot of a tree. "All four specimens are adult males, which would have been roving around looking for females at this point in their lives," Selden said. "Chimerarachne most likely wove a sheet web, and possibly a burrow lined with silk. Spiders use silk for a great many purposes, of which prey-capture webs is just one. Egg-wrapping is a vital function for spider silk, as well as laying a trail to find its way back home." The research was published in the journal "Nature Ecology & Evolution."